I thought it would be fitting to start with Yellowstone as my first of 60 National Parks. In case you are wondering, because I was, Pinnacles & the Gateway Arch were recently added to the list making the grand total 60 not 58 National Parks. I decided to start with Yellowstone because I grew up with Yellowstone. I have visited multiple times over the years and pretty much done the whole park at this point. It is also the FIRST National Park which is another reason it should be #1! My parents and I went in April and many of the roads were closed so I am going to pull pictures from previous trips! I will note that my journeys to Parks near friends or family will be a little lacking on where to stay and places to eat. We can easily do Yellowstone in a day from Bozeman; it's only about an hour to 1.5 hours in either direction. I am going to try as hard as I can to be consistent in describing each park; however, life is not perfect so sometimes I may have more or less! I really want to write a story with each park, a personal journal, if possible. I'm still in the process of discovering what I want my blog to be. I think it's a great travel guide but I would like to add more creativity into it. I find these photos sometime, though informative, underwhelming. I follow some pretty inspiring people though and when I look back to when they got started I still have hope for my future! the parks are ever-changing; I always recommend you check their official website before you visit!!! The best map I can find, the simplest map, is from the park service website. We usually enter via the North Entrance due to our location yet I believe most people stay in West Yellowstone and enter from there. Listed are suggestions for places to visit. I did my best to move from North to South on the map and included the closest location to each spot for you to reference on the map above. Since there is SO much to do and cover in Yellowstone, and I have never camped, fished, or hiked, I am not going to include those in this travel guide. However if I go back to Yellowstone and do said things I will create and link another blog post for those of you who want to go further! My goal is to see and do unique things in most of the Parks but sometimes you just have to play tourist! I almost made the Yellowstone travel guide and forgot one of my favorites, The Boiling River. Because I usually end up doing it so much throughout the year I completely forgot. Bring your swim trunks and sit in a natural hot springs; don't forget a towel, and no alcohol or glass! The Boiling River is an area where hot springs water runs into the river. People have built it up so you can sit in the river and enjoy the warm water! It's a short and easy hike from the trail head and extremely enjoyable espeically in the winter. This area is closed in the spring due to too much water run off so make sure you check with the park first. The Boiling River is located on the left as you drive from the Gardiner Entrance to Mammoth. I actually went a few months ago and posted about it HERE so check it! Mammoth Hot Springs are located in, you guessed it, Mammoth. Honestly the hot springs are a lot less active than they used to be. They, at least this time and to me, seemed dried up. But they are still very pretty with a range of colors. It's kind of fun because when you enter through Mammoth it's the first time you smell sulfur! Usually a lot of elk and wildlife can be found in Mammoth - literally they graze and lay around the city. I seem to see a lot of pictures of them in front of city hall. It's important to keep your distance though as recommended by the park! Lamar Valley is near Tower-Roosevelt Area. It's the perfect place to watch for wolves if you are patient enough; however, make sure you bring your zoom lens or are nice to the guy next to you with the big lens. A lot of wildlife can be found here in the valley but like I said usually they are little dots in the distance. Roaring Mountain can be found on the way to Norris from Mammoth - aka to the North of Norris. The day that we went it wasn't extremely active. In face there was quite a bit of snow left. Roaring Mountain is a large, acidic thermal area (solfatara) that contains many steam vents (fumaroles). In the late 1800s and early 1900s, the number, size, and power of the fumaroles was much greater than today. This Norris Geyser Basin area was recommended by everyone who visited Yellowstone (I put out a poll on Instagram) and honestly it was likely my favorite area. There are plenty of active geysers and hot spots and the variety of colors are breathtaking. 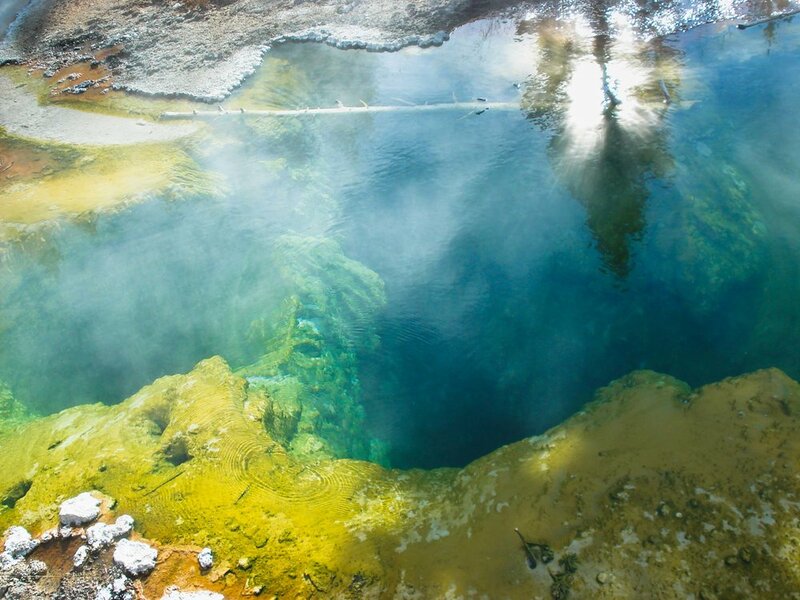 Norris Geyser Basin is the hottest and most changeable thermal area in Yellowstone. There are 2 & 1/2 miles of trails; however, many were closed in April. The world's tallest active geyser is located there and has been extremely active. I would highly recommend you stop here! Located between Madison and Old Faithful, this was also on my list for favorite place! I love the colors of the pools and seeing the active mud pots and geysers. I also recommend you stop here! If you watch my vlog below I showcased some of the mud pots. The Midway Geyser Basin was also located between Madison and Old Faithful. Okay I lied the colors here were phenomenal too. One of the things I discovered on my trip to Yellowstone was the variety of colors. Before, when I wasn't looking at the world as a photographer, I didn't see colors, clouds, light, etc they way I do now. Call it a blessing, call it a curse. I would love to make a few trips back to Yellowstone to photograph the colors again at different times of day. But more on this area: Excelsior Geyser reveals a gaping crater 200 x 300 feet with a constant discharge of more than 4,000 gallons of water per minute into the Firehole River. Old Faithful, the main attraction, well two things, okay actually. She isn't as faithful anymore, the picture below is not from Old Faithful, we didn't want to wait for her on this trip, & the crowds are just too big. I don't know that I need to go into too much detail about this one BUT I would recommend you check the times for her eruption because you can plan a hike or lunch around it instead of having to sit around and wait. Unfortunately this area was closed when we visited yet another reason I want to go back. This waterfall is one of my favorite for no real reason... I guess I just like water. Anyways there are a few waterfalls near the Grand Canyon, which is located near Canyon Village. There is an upper and lower falls (seen here). Tower Falls is near the Tower-Roosevelt area. The 132-foot drop of Tower Creek, framed by eroded volcanic pinnacles has been documented by park visitors from the earliest trips of Europeans into the Yellowstone region. Its idyllic setting has inspired numerous artists, including Thomas Moran. His painting of Tower Fall played a crucial role in the establishment of Yellowstone National Park in 1872. The nearby Bannock Ford on the Yellowstone River was an important travel route for early Native Americans as well as for early European visitors and miners up to the late 19th century. Located near West Thumb and Grant Village Area, Yellowstone Lake is largest high elevation lake (above 7,000 feet) in North America. It is roughly 20 miles long and 14 miles wide, with 141 miles of shoreline and a surface area of 132 square miles. Yellowstone Lake freezes over completely every winter in late December or early January, with ice thicknesses varying from a few inches to more than two feet. The lake usually thaws in late May or early June. Yellowstone Lake remains cold year-round, with an average water temperature of 41°F. Because of the extremely cold water, swimming is not recommended. Survival time is estimated to be only 20 to 30 minutes in water at this temperature. Yellowstone Lake has the largest population of wild cutthroat trout in North America. Also located near the West Thumb and Grant Village Area is the West Thumb Geyser Basin. The West Thumb Geyser Basin, including Potts Basin to the north, is unique in that it is the largest geyser basin on the shores of Yellowstone Lake. The heat source of the thermal features in this location is thought to be relatively close to the surface, only 10,000 feet down! "And that's it", she said exhaustively! Yellowstone National Park is a wonderful and magical park. It is extremely large and, as you can see, there are A LOT of things to do. And I barely touched the surface. There are so many activities beyond the normal tourist attractions including snowmobiling in the winter, hiking, camping, and fishing. Along with being vast there are so many unique features about Yellowstone, including the history (the FIRST National Park), wildlife, geological features, and of course the smells and colors! Since a picture is worth a thousands words I thought I would step it up and make a vlog - Yellowstone in TWO minutes! TELL ME: If you have been to Yellowstone what is your FAVORITE place or memory? If you haven't been, what do you want to see? And most importantly tag me on your adventures! I would LOVE to hear from all of you!